If there is anything we love in Gulf Shores and Orange Beach, it’s a good old-fashioned, down-home reason to kick back and have a good time. That’s why Mardi Gras is anticipated all year long here. It fits in perfectly with our tradition of warm Southern hospitality and fun with friends who have come to visit. Parades and Beads -- Twice! You want beads? We have beads, lots of them. In fact, with two parades starting at opposite ends of the thirty-two miles of sugar-white sand beach, the family will be loaded down with strands of faux jewels by the end of the day. Don’t worry; the parades are scheduled not to conflict. The Gulf Shores Mardi Gras procession begins in the morning and ends in plenty of time for you to make the Orange Beach event. We wouldn’t necessarily say the two communities have a good-natured rivalry for honors as sponsoring the best parade, but we wouldn’t say they don’t either. So find your spot along the boulevard, put your hands in the air and give a shout. If you’re lucky, you might even snag a MoonPie sailing through the air. 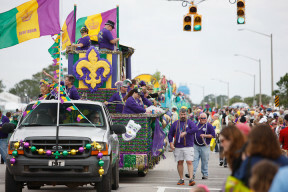 Originated in 1978 by the local Pleasure Island Players, the City of Gulf Shores takes the lead these days in organizing its Mardi Gras Parade. Featuring the Mystic Order of Shiners, the oldest Mardi Gras parading order in Baldwin County, the parade has continued to grow each year. 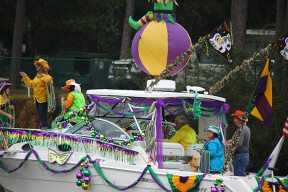 Beginning at 10:00 AM on East Beach Boulevard at the intersection with Highway 59, the floats, marching bands, and paraders move along the boulevard, finishing big at the Gulf State Park Pier where you can mingle with new friends and get a closer look at the characters and costumes. The Orange Beach parade began years ago when several groups wanted a chance to parade along the beach. Now, it is organized each year by the City of Orange Beach. Join the 30,000 enthusiastic spectators lining Perdido Beach Boulevard for the annual event. The parade begins at 2:00 PM and follows a two-mile route along the boulevard including marching bands, floats, and lots of beads. You’ll even find some of the Gulf Shores paraders who haven’t quite finished their celebrating, appearing in the Orange Beach procession. 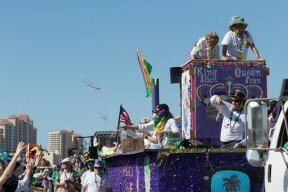 The weeks leading up to the official Fat Tuesday Carnival are full of fun and entertainment sponsored by the Mardi Gras Parade Orders and participants. 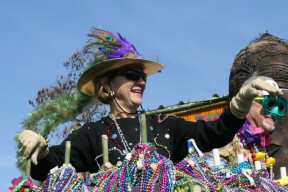 Check the Gulf Coast calendar of events for all of the Mardi Gras happenings. You'll find events for kids and grownups alike, so make a vacation of it and join the festivities. It’s a tradition and a celebration. Mardi Gras along the Alabama Gulf Coast is a special time complete with shouts of “Laissez les bons temps rouler” — Let the good times roll! — and throws of beads, raining down from passing floats. Come share the joy with us. Plan your Alabama trip during Mardi Gras! Escape and discover a whole different state of Carnival fun and festivities. Make sure to book Gulf Coast lodging ahead of time, including Gulf Shores and Orange Beach condo rentals, beach hotels, and house rentals.